The yoga I was searching for, the balanced combination of mindful attention, intention and heart, I found only when I met my teacher Noga Barkai, in Jerusalem. Being introduced to Vijnana yoga was a meaningful moment in my practice. Devoted to being on the mat, I have been teaching ever since; through many moves, cultural adjustments, two pregnancies, and two degrees. In 2005 I completed one year of advanced teacher training with Orit Sen-Gupta, founder of Vijnana yoga, and in 2008 I got certified in prenatal yoga. Finally, in the summer of 2018 I received my 800 hour Vijnana teacher certification from Orit Sen-Gupta, with much joy. Leah will offer a soft flow class appropriate for all levels. The emphasis in this practice will be on finding joy in movement and in sharing space with others while connecting and being moved by the vibrations of live sounds. By combining two nurturing experiences - healing music and yoga, we are hoping you will leave this class feeling deeply relaxed, grounded and open in your body. ​Lydia Riedell has been a facilitator of Transformational Sound for both personal and planetary evolution for over 15 years. 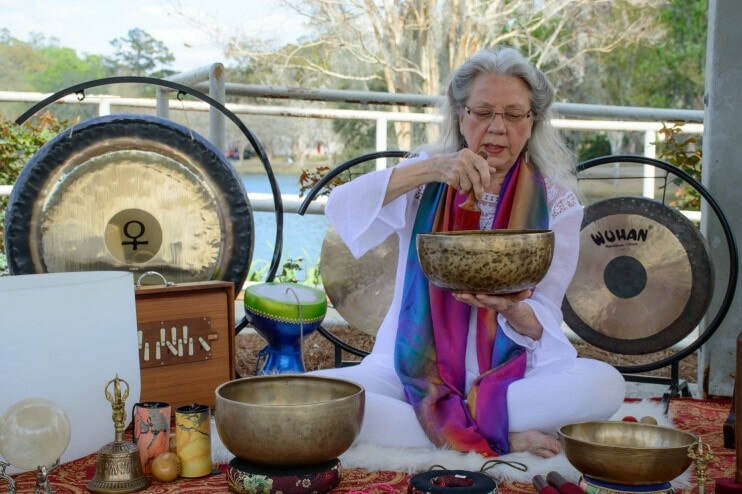 Lydia co-creates sound with instruments such as Himalayan Singing Bowls, Gongs, Bells, Chimes, Crystal Bowls, Drums, Rattles, Tuning Forks, and her voice. Sacred sound is an ancient art and is used in the creation of a Sound Journey and as a beneficial companion to spiritual practices such as Meditation, Yoga, and Qigong. Transformational Sound paired with any of these practices evokes deeper states of relaxation for overall health and well-being, cultivates profound stillness for greater mental clarity, creates presence of mind for accessing creative solutions, and generates expanded states of personal/planetary awareness and consciousness. To reserve your spot please complete the form below. Spots are reserved on a first come, first served basis. Please include your phone number in the email so that we can call to process your payment or make arrangements to do so. We will provide a yoga mat and bolster. Please feel free to bring your own mat and any other accessories that will make this a comfortable experience for you. Heading North on Route 27 (North Monroe St.) from Tallahassee take a right at the second traffic light onto 7th Avenue East. We are the 4th store front on the left, #110. Heading South from Bainbridge on Route 27, take a left at the first light onto 7th Avenue East.